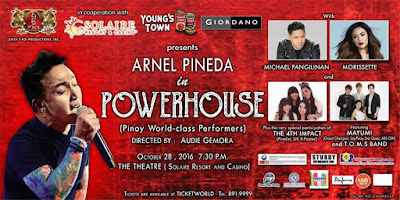 Lucky 7 Koi Productions, Inc., a group of friends of Solaire Resort & Casino, proudly present Powerhouse (Pinoy World-class Performers) concert on October 28 2016 (Friday) at 7:30pm at The Theatre of Solaire Hotel. 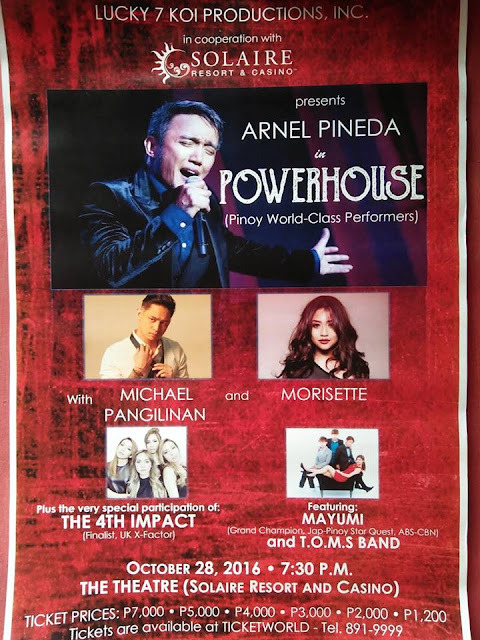 Artists who will perform are Arnel Pineda of The Journey band, Michael Pangilinan, Morissette Amon, 4th Impact (X-Factor UK 2016 finalist), Mayumi (Grand Champion Jap-Pinoy Star Quest of ABS-CBN), and T.O.M.S Band. Arnel Pineda is an international rock artist. He is a former vocalist of Ijos and Amo Band in the 80's before he joined The Journey band. The group saw a video of Arnel online whose voice was strikingly close to that of Steve Perry, legendary front man of The Journey. This prompted the group to invite Arnel to officially audition, and eventually was chosen to be the vocalist of the band. Arnel has been doing sold out shows with The Journey in Chile, Las Vegas, and many parts of the world. 4th Impact (formerly 4th Power) is a star group after finishing as a finalist in the X Factor UK 2015. The girl group is composed of 4 sisters: Almira, Irene, Mylene and Celina, who have been singing as a group for over a decade already. 4th Impact wowed the international audience in UK and made their home country so proud. Michael Pangilinan won the hearts of many when he landed 2nd place in the Your Face Sounds Familiar Season 2 on ABS-CBN. Prior to that, he interpreted twice in ABS-CBN's Himig Handog P-Pop Love Songs in 2014 and 2016 with his song "Pare, Mahal Mo Raw Ako" in 2014 garnering more than 8 million views on YouTube. Pangilinan has just released his second album under Star Music with "Hanggang Kailan" as its carrier single. This heartthrob of the music business is really a born superstar. Morissette Amon is undoubtedly one of the great divas in the music industry today. She always wows her audience with her powerful performance and with her whistle singing. After landing as a finalist in the first season of The Voice of the Philippines, Morissette's career soared high. Before Morissette's fame, she has already joined in various singing competitions on Philippine television. 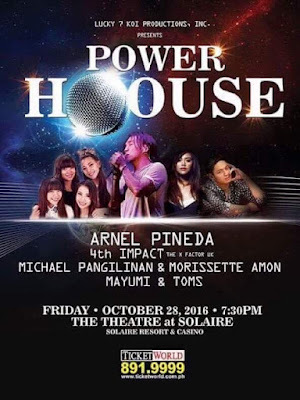 Morissette has sold out shows here and abroad and sang theme songs of ABS-CBN's various teleseryes. In 2012 she made her musical theater debut in Repertory Philippines production of Disney's Camp Rock. The four artists will be joined by Mayumi and the T.O.M.S Band – all world-class, in a once-in-a-lifetime concert at The Theatre of Solaire Resort @ Casino on October 28, 2016 at 7:30pm. 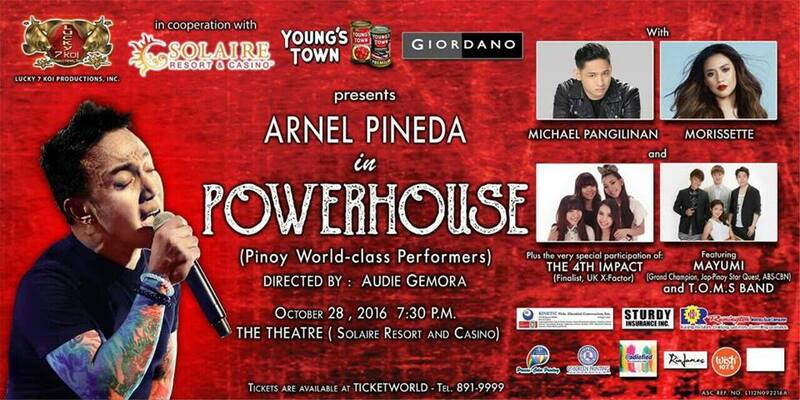 The venue is at The Theatre of Solaire Resort & Casino located at 1 Aseana Avenue, Entertainment City, Paranaque City.